Hi, I am Nieves Isabel. Petite Girls Diet is dedicated to Petite Women that want to lose weight and maintain it in a good healthy range according to their height and life style. The picture in this page was taken in the krishna turistic village in Chancay, Peru. It was one of the bus stops visiting the north of Lima, Peru with my family . 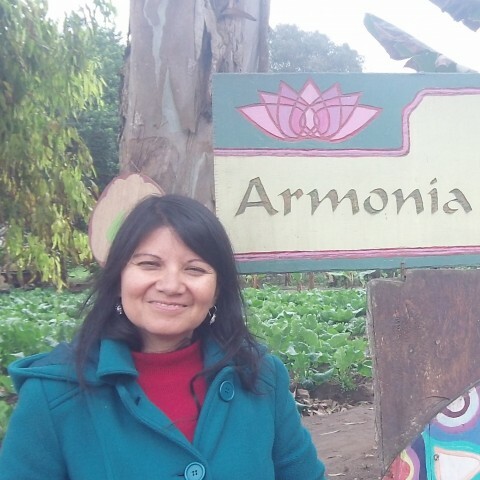 “Armonia” means “Harmony” in Spanish and it . Harmony is a state of mind that I desire to attain everyday and I know it is a good state of mind to maintain an ideal weight. I use to struggle with my weight for many years. When I was a child I suffered from exercise induced asthma. The doctor told my mom that I had to eat a lot, that I should stop going to my beloved ballet class and avoid strenuous exercise. He recommended painful shots and tons of vitamins too. I remember when my mom used to wake me up very early on Saturday mornings to give me a super vitamin complex that tasted yucky. After a while the asthma went away and I felt better and healthier but I keep the weight. When I finished high school I went to a doctor that recommended a 800 calorie diet because of my height. It was very painful to follow but I did it and I lost 28 lbs/14 kg and I look and felt good. You know that for petite women ( women shorter that 5’2’’) to gain or lose any quantity of pounds is going to get notice; your clothes are going to feel loose. It was difficult for me to maintain the ideal weight , I gained and lose weight several times but for the last twenty years my weight have fluctuated between 96-100 lbs/ 44-47 Kg and I considered it to be my healthy weight. I want to share my journey and inspire you to maintain your ideal and healthy weight. Studied Medicine at the Universidad de San Marcos, Lima Peru. She worked as Family Physician in Peru and Health Educator in New York. She is married with children and has a blast raising them. prevent diseases and have a joyful life. Hi there Nieves. My wife falls into your petite girls category at just about 5’2″. She used to be quite heavy when I met her (42 years ago), but for the last 35 years has been quite thin. She maintains her weight through very rigid diet. She’s always gotten plenty of exercise, but she is determined to be thin. Myself, I’ve 5’10, and have been as heavy as 210 lbs, and right now at about 175. A few years ago I had been really dieting and exercising and was actually down to under 150. I would like to be about 160 actually. I can appreciate all the good diet information because this is such a timely topic. There’s so many people who are dangerously overweight, and then so many women who are dangerously thin. What a culture we live in. Thanks for your knowledge and your efforts. Jim. Hi Tim, I am glad that you and your wife are determined to keep a healthy weight by eating nutritious food and doing exercise. It can take some time but you can do it with the right attitude and information. Keep the good work. Thank you for your comment.